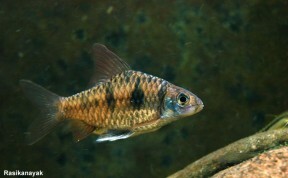 Male from the European aquarium trade. Adult male in its natural habitat near Kudremukh, Karnataka state. Individual collected at Gangamoola (aka Varaha Parvatha) mountain, Karnataka state. 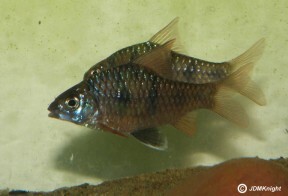 Adult male in the aquarium. Group in habitat near Bangalore, Karnataka state. Male from the Singapore aquarium trade. 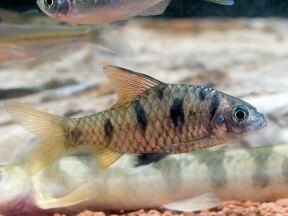 Female from the Singapore aquarium trade. 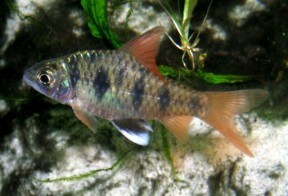 Female from the European aquarium trade. sahyadriensis: named for the Western Ghats mountains which are also known by the alternative name ‘Sahyadri’. Described from streams of the Yenna river basin, close to the city of Mahabaleshwar, in the Western Ghats mountain range, Satara district, Maharashtra state, India, and endemic to northern and central parts of the Western Ghats mountains. It’s been recorded from the Yenna, Koyana, Krishna, Sharavati, Tunga, Bhadra, Aghanashini, Bedti, and Sita drainages. This species’l stream habitats are generally shaded by the forest canopy and dense marginal vegetation. Substrates are typically composed of boulders, smaller stones, sand or gravel with submerged tree roots around the margins and quieter areas in which fallen branches and leaf litter collect. It can be found alongside numerous other fish species of which a few occurring in the Tunga River include Barilius bakeri, Devario malabaricus, Dawkinsia arulius, D. assimilis, Pethia ticto, Dravidia fasciata, ‘Puntius‘ setnai, Garra mullya, Psilorhynchus tenura, Nemacheilus anguilla, Schistura nilgiriensis, S. semiarmatus, S. denisonii, and Aplocheilus lineatus, for example. Base dimensions of at least 80 ∗ 30 cm or equivalent are required. This could be further furnished with driftwood branches and plants such as Microsorum, Bolbitis, or Anubias spp. which can be grown attached to the décor. Since it naturally occurs in relatively pristine habitats it’s intolerant to accumulation of organic pollutants and requires more-or-less spotless water in order to thrive, meaning weekly water changes of 30-50% tank volume should be considered routine. Though torrent-like conditions are unnecessary it also does best if there is a high proportion of dissolved oxygen and a degree 0f water movement. Likely to be a foraging omnivore feeding on worms, insects and other small invertebrates, as well as plant material and organic detritus. Silas (1953) noted that 90% of the stomach contents of specimens he dissected comprised filamentous green algae of the genus Spirogyra. In the aquarium it’s easily-fed but the best condition and colours offer regular meals of small live and frozen foods such as bloodworm, Daphnia and Artemia, alongside good quality dried flakes and granules, at least some of which should include additional plant or algal content. Fishes inhabiting similar biotopes in nature, especially comparably-sized, open water-dwelling cyprinids perhaps constitute the best choices but other potential options include balitorid, cobitid, and nemacheilid loaches as well as benthic cyprinids such as Crossocheilus and Garra species. The interaction between rival males is interesting to watch and they will display their best colours when competing for female attention or hierarchical position. Adult males develop a more intense colour pattern than females, possess white-tipped pelvic fins, and exhibit noticeable tubercules on the head when in spawning condition. 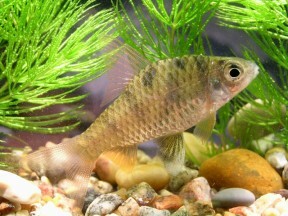 Females tend to grow a little larger, are heavier-bodied, and less colourful. 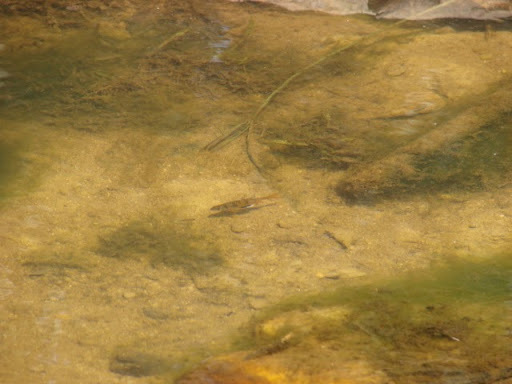 Like most small cyprinids Puntius spp. 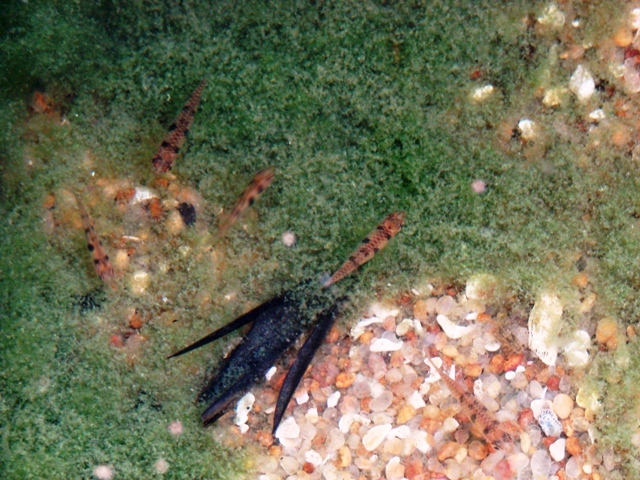 are egg-scattering free spawners exhibiting no parental care. This species is occasionally traded under the alternative name ‘Khavli’ barb but not a great deal has been written about it or its captive care. 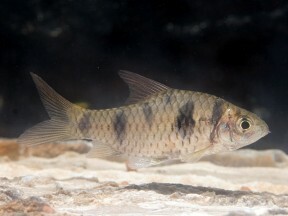 It’s difficult to confuse with any other member of the genus due to its somewhat angular body shape, unique colour pattern, and enlarged dorsal-fin in males. The genus Puntius was viewed as a polyphyletic catch-all containing over 100 species of small to mid-sized cyprinid for a number of years until Pethiyagoda et al. (2012) published a partial review covering South Asian members. P. sahyadriensis was tentatively retained in Puntius sensu stricto based on the fact it shares the external diagnostic charcters for the genus which consist of: adult size usually less than 120 mm SL; rostral barbels absent; last unbranched dorsal-fin ray smooth; 8 branched dorsal-fin rays; post-epiphysial fontanelle present. Notes on fishes from Mahableshwar and Wai (Satara district, Bombay state). Assemblage structure of stream fishes in the Western Ghats (India).